The Product-Market Matrix, also known as the Ansoff Matrix, is a very useful tool to identify and analyze a company’s business expansion opportunities. 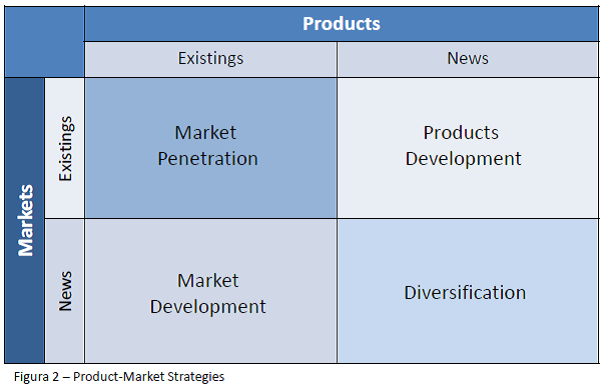 This matrix illustrates the four distinct strategies that Ansoff envisioned for enhancing a company’s business: market penetration, market development, product development, and diversification. 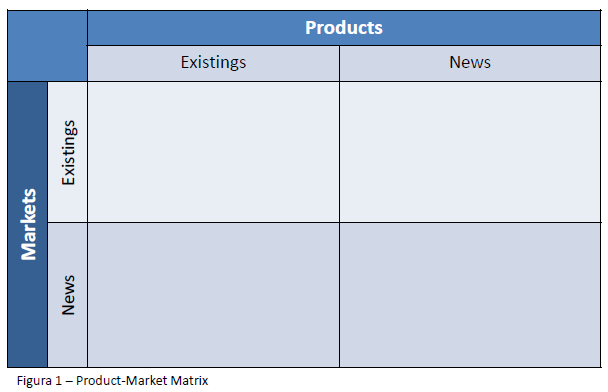 The matrix has two product dimensions, two market dimensions, and four quadrants, as shown in Figure 1. Market penetration: the company aims to sell its current products in an existing market. The strategy seeks to increase its presence where it already operates. Market development: the company wants to sell its existing products in a new market. This strategy should include markets like the current one and project the expansion of its business. It needs to consider factors like geographical location and maturity. Product development: the development of new products in existing markets. This can be done through improvements in product and technology. Diversification: the development of new products for new markets. This strategy seeks innovation, which inevitably creates risks, as the company is venturing into unknown territory. Figure 2 illustrates the four strategies placed in the matrix. Now that you know each of the strategic alternatives, in terms of market and/or product development, of the Ansoff Matrix, you can go ahead and apply them in your company.